Taking a walk on an August afternoon, there was a feeling of change in the air and an end to the recent hot weather. Used as a location for the BBC series Poldark and not having visited before, I anticipated something special and wasn’t disappointed. As the beach opened out I could see the whole bay in front of me. In the distance was a rocky headland, on my right side huge sand dunes and to my left two enormous peaks. Known as Gull Rocks or Carter’s Rocks, these dramatically rise from the sea about 500 yards from the beach. The tide was coming in, the swell getting bigger and people were leaving the beach as the wind strengthened with the threat of imminent rain looming. Filled with inspiration, I took my pad, did a couple of rough sketches and took a couple of photos of this amazing place, before heading back to the car and shelter from the incoming squall. 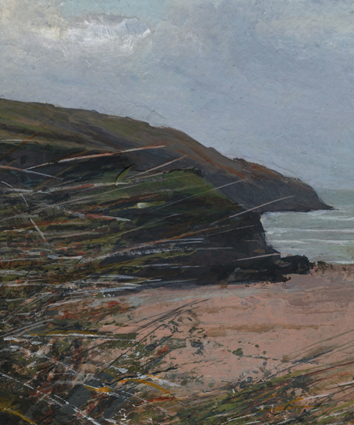 I wanted to capture the essence of Holywell Bay, Gull Rocks and the atmosphere of that blustery day on the beach, with the marram grass of the dunes, turquoise Atlantic and the threatening skies. The resulting painting is in acrylics on watercolour paper with the image measuring approximately 14 x 10 inches. This original painting is framed and ready to hang, with a cream coloured mount and a natural oak moulding, measuring 500mm x 400mm. This entry was posted in Acrylic Painting, Seascape. Bookmark the permalink.